It seems I have a thing for getting friendly with grandpa age guys. I think it’s because I like hearing what people have to say and geriatrics seem to like talking. I hear about way back when, wives dying and the best way to get roses to thrive. Once I even had a hula hooping contest with the nursery door greeter at Wal-Mart. He won. Soundly. There is this one guy that sells crap in front of an old house. I don’t know if he owns the house because he doesn’t live there. He pulls up his truck and sits in it and when you drive up and park he gets out and tries to get you to take home the stuff that he’s had sitting out in the elements for ages. Perhaps he doesn’t even own the home and his wares are squatting! It’s hard to get him because he’s only out there when he wants to be. So the weather has to be nice and traffic has to be good. 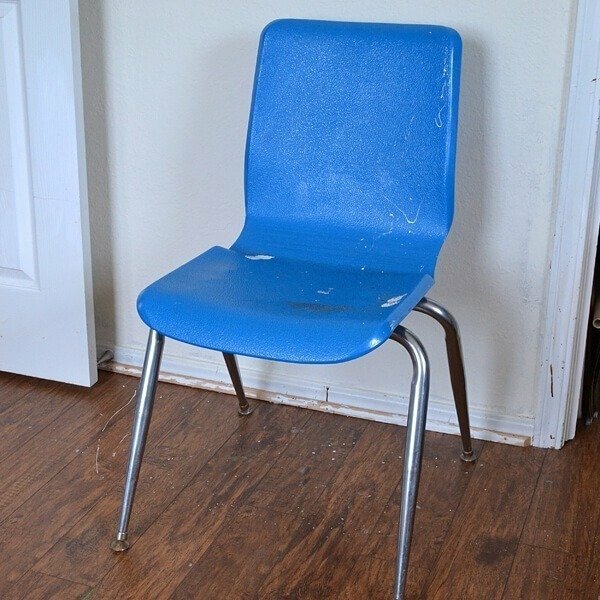 I had seen some school chairs out and I really, really wanted one but I could never seem to pass by when he was there. Then, one day he was and he asked what my offer was. I informed him that I was willing to pay $5 for one chair. His counter offer was that I had to take two for the cost of $5. I only needed one, but I took the two! 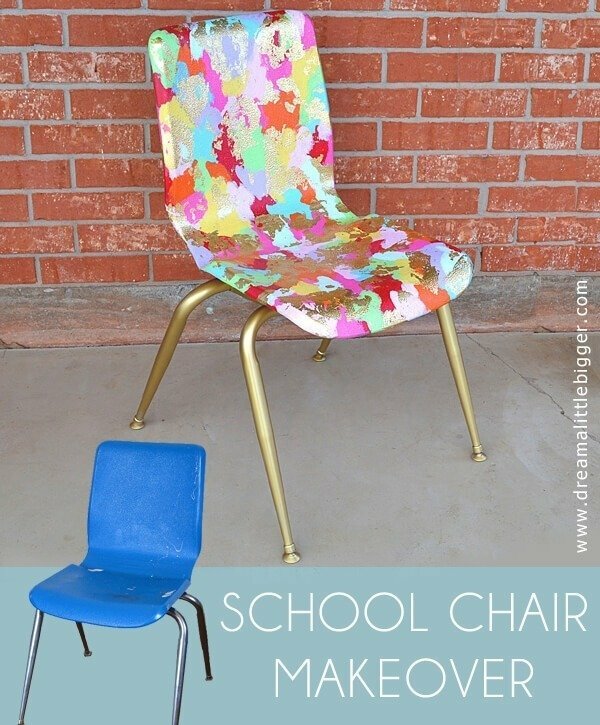 What a perfect price to start a school chair makeover, eh? Turns out this is apparently the best back chair my dad has ever sat in. So one went to live with him and the other kept on with its original purpose. It’s my secondary office chair. Whenever my Momma or my nephews want to come and chat while I’m working, that’s where they sit. If my dad wants me to chat while he works on my computer, that’s where I sit. Whenever I need to reach something up high, it’s my step stool. Whenever I’ve had cats on my lap for 6 hours straight and my hips have begun to hurt, that’s where I plant the kitties to spend the rest of their office time. In the end, I decided that it only made sense to paint this chair in the style that I developed when I was in school. It’s not the most amazing artistic pursuit but it was a style all my own. 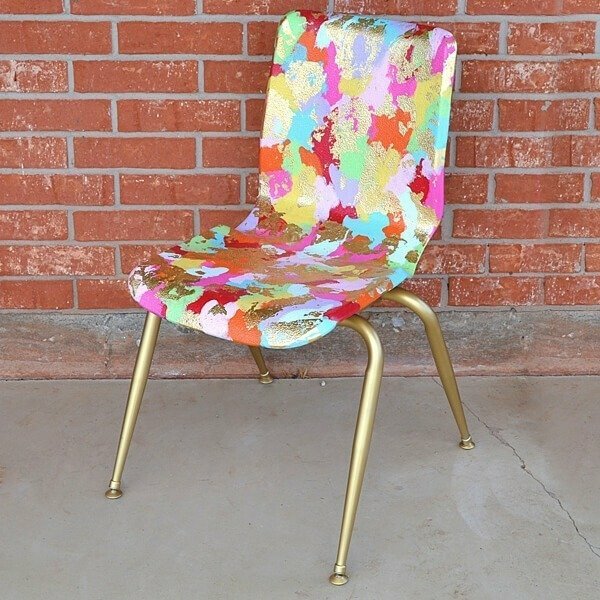 And since this is a school chair, why not have it be a chair for art class ? Here is my chair before. It’s nothing special and the back has “Edmond High” written on it in marker. The seat is cracked a bit in places (where the screws come through underneath) but there’s no structural problems from it, just the appearance. My initial plan had been to decoupage a poster to it, but the surface is very, very bumpy so that’s just going to have to wait for a new chair. When I made some Easter eggs in the same style I used to paint, it was so much fun and I found myself using my leftover paint on my work-space paper protectors and figured that why not have that in my office prominently? 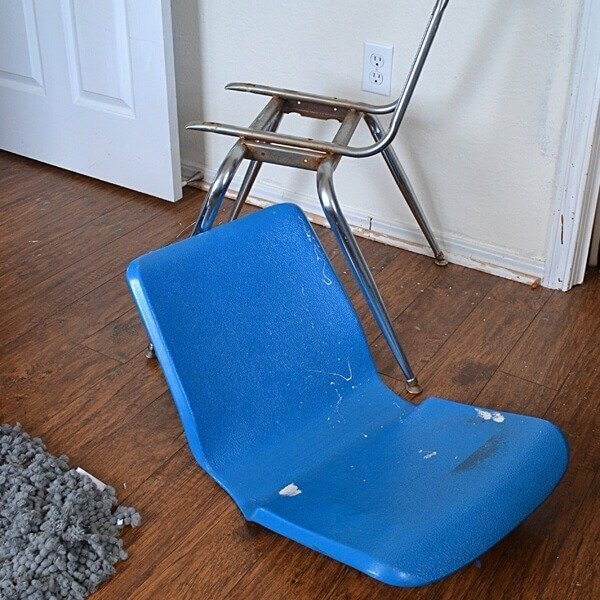 First I took my chair apart. It was simple but instead of a normal screwdriver I had to use a square shaped bit. Luckily Russell got a new bit set for Christmas that had exactly what I needed. This thing is so handy, it’s been staying in my craft room and since he hasn’t even noticed it’s staying here! I primed the legs with rusty metal spray primer since this sucker had been sitting out in the elements for who knows how long. I used traditional primer on the seat, but I think I should have used a base of plastic spray paint instead. I gave the whole thing 2 coats of my favorite gold paint and let it sit outside long enough to air out. Then, I started to paint. And unfortunately I do not have the images from gold leafing, but I’ll tell you what I did. I took a 1/2 inch bristled brush and made large expanses of the adhesive, but in very thin applications without going back over (so that some areas would be without and the gold leaf wouldn’t adhere giving it a nice, mottled appearance. Place a sheet of leaf onto the adhesive and allow to sit until dry. Then take your brush and rub away the excess leaf (you can collect this and use it in a later project). I sealed my chair with spray polyurethane rather than the sealer that came with my kit, simply because it was MUCH faster that way. When I asked Russell what he thought he said he didn’t care for it. At all. And you might think it’s ugly, too, but that’s cool because this is my office and that’s my chair and I love it! Oh my gosh! This is an amazing make over! It looks so classy but so eccentric! I feel like I must have one! 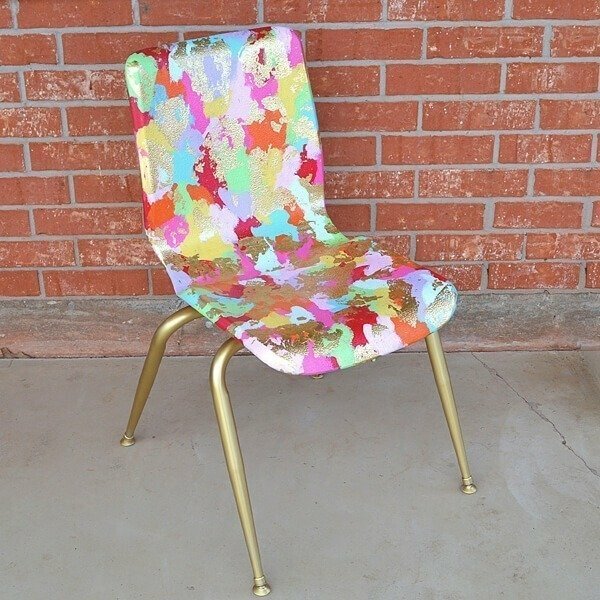 Your eggs were wonderful but gold leafing a chair, brilliant. Love it. very creative-job well done…esp. the how to! 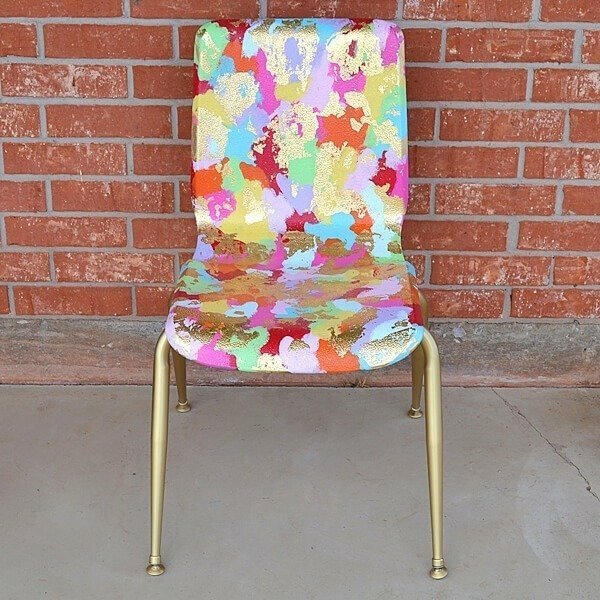 When you get tired of it, I’m sure it would sell for big bucks in a specialty boutique..as many would love to have a one of a kind chair like that! WONDERFUL!! I have a plastic chair that I am a bit bored with and a very neutral dove gray room, that needs a pop. Totally doing this. Well, some people just don’t know a beautiful chair when they see it do they?! It is a thing of beauty and will be a joy forever! 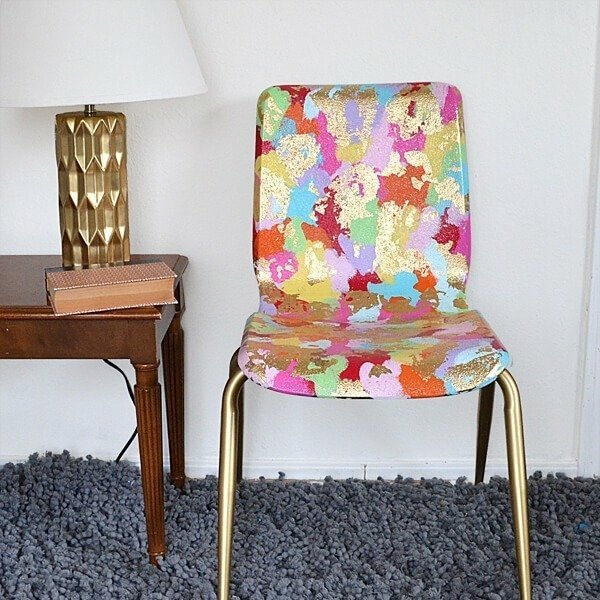 I love your chair its fabulous and I love your post even more fabulous ! Thanks for a great and very entertaining read. now where can I get my hands on one of those chairs…………. 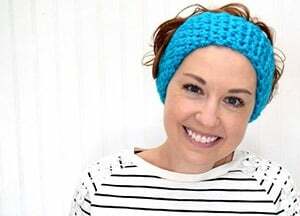 Hi, Allison! The link to this is up on buzzfeed today and I hope you get tons of visits because it’s the COOLEST!!!! 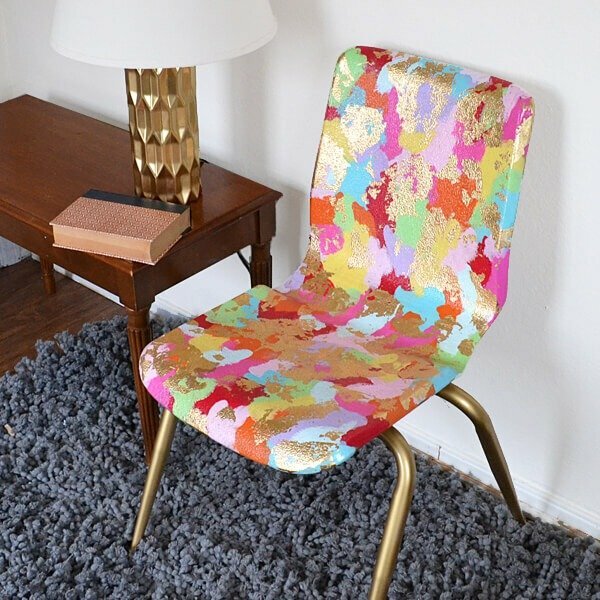 I have two of this exact chair in green, and have been wondering if they were paintable. Gonna do it! 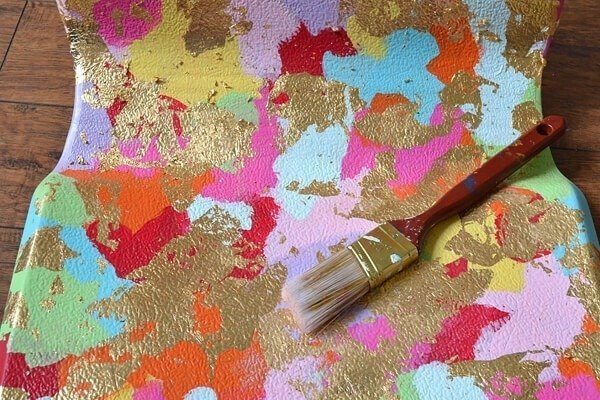 J’adore your fun technique with gold leaf – I think it’s stunning, mod and adorable. Thanks for the fabulous post! Honey, that there is a DESIGNER chair. That you’re the designer is the icing on the cake. If I could figure out how to add stars or hearts to this message, there would be at least 10. I absolutely LOVE it. I’m following you from now on because goodness knows, anyone who designed that chair has got to share my tastes! You totally inspired me. My office was circa 1976 decor and everything was brown! We have almost zero budget so for a $3.97 bottle of spray paint I turned brown chairs into a beautiful lagoon blue! They are the perfect pop pf color for my office!